The word “doctor” originated form the Latin “docere” meaning teacher or to teach. My practice philosophy was founded on this simple principle: to educate my patients about their oral health, how to take care of it, how and why things break down, how to best restore it and, most importantly, how to make it last and be esthetically pleasing for a lifetime. Along with being a “teacher”, I strive to be a good listener. By listening, my staff and I are able to understand our patient’s immediate concerns and their long term goals. You will find our treatment recommendations practical, realistically attainable and grounded in evidence based dental research using state of the art equipment and techniques. 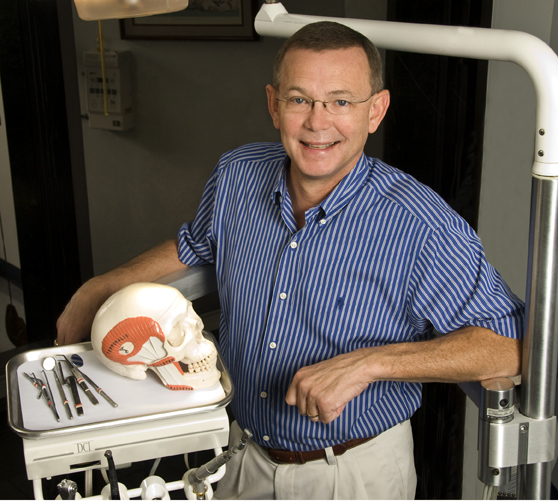 We are dedicated to meeting or exceeding our patient’s expectations at each and every visit. I am a proud graduate of the Fightin’ Texas Aggie class of 1979, received my Doctor of Dental Surgery in 1982 from the UT Health Science Center in San Antonio, TX, served in the United States Navy Dental Corps and have achieved both a Fellowship and a Mastership in the Academy of General Dentistry. I have practiced here in the Austin area since 1985 and in the same location since 1993. In addition to a full range of preventive, periodontal, endodontic and restorative services, I have a particular interest in tempromandibular joint dysfunction (TMJ). I have studied extensively at the Dawson Center and the Piper Education and Research Center, both in St. Petersburg, FL, to properly diagnosis and treat this often painful and complicated condition. I have two sons, Andrew, Fightin’ Texas Aggie class of 2010 and Taylor, Corps of Cadet E-2 Fightin’ Texas Aggie class of 2013! Whoop!!!!! I am married to my wife Donna, the Love of my Life and the BEST fishing partner EVER!!! Besides fishing bass tournaments with Ms. Donna, we enjoy cooking at home, gardening, reading and handgun/personal defense training. We both keep up with all things NCAA football (Donna just pulls for the wrong team) and MLB baseball (Go Astros!). I also love collecting Morgan silver dollars and rare coins. I am active in the Presbyterian church and have served as a deacon and an elder.